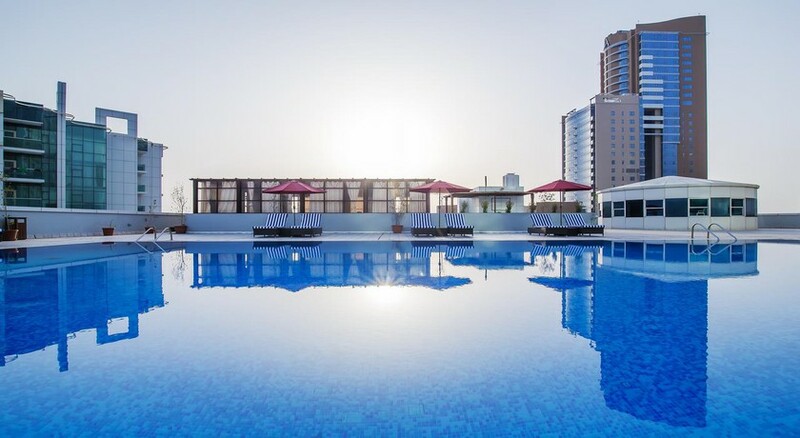 Concorde Hotel Fujairah is a chic 5-star property, located in the heart of Fujairah on the city’s busy road, Sheik Hamad Bin Abdulla, simply 15 minutes from the Fujairah port and five minutes’ drive from the Fujairah International Airport. The hotel offers luxury accommodation with free parking and a rooftop swimming pool overlooking the Hajaar Mountains. There are five eateries serving delicious cuisines from around the world and light bites. The luxurious rooms, furnished with elegant interiors come with either mountain or ocean views. Guests prefer this hotel for its convenient location, comfortable facilities and warm hospitality in the busy district of Fujairah. This property is twelve minutes’ walk from the beach. The Concorde Fujairah is located in the heart of Fujairah city. The famous Lulu Shopping Mall is a 5-minute walk from the hotel. Fujairah International Airport is five minutes away by car. 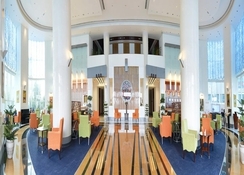 The 5-star Concorde Hotel Fujairah offers easy access to the city for business and leisure travellers. The property is also within simple walking distance to several shops, restaurants and tourist attractions. The accommodation at Concorde Hotel Fujairah boast elegantly furnished rooms and suites with views of the ocean or mountains. Fitted with elegant furniture, every room and suite is provided with satellite television, minibar and an en-suite bathroom which has robe with slippers. There is 24-hour room service. This 5-star hotel offers an excellent selection of fine dining restaurants and room service facilities. The all-day dining restaurant, Belle View offers a range of buffet breakfasts, lunches and sit down dinners, whereas the Al Shorfa Levant restaurant is for oriental Arabic cuisines, providing a la carte menu with a flavours from the Levant region. One may also get pleasure from the Queen of Sheesha lounge where guests are treated to ancient music as they smoke the Sheesha and enjoy light bites served at the cafe. The Bistro cafe serves appetizing pastries and pies and The Splash Pool Bar is an excellent spot by the pool to enjoy sunshine with your favourite drink. Guests can stroll around the AinAl Madhab Gardens or visit the Ottoman Mosque, Fujairah Fort and Fujairah Museum. The city has everything, from ancient markets to fashionable shopping malls. Eating out can be a heavenly experience with several Persian, Lebanese, Arabian and international restaurants around the hotel. Guests can relax at the Concorde Spa and Fitness with its spa bath, sauna and steam bath. A refreshing drink at the rooftop Smash Pool Bar with its views of the city skyline will recharge you. Those willing to keep active during their Dubai stay can visit the gym.